This dish is called bhajji curry because we use the same mixture that we use for making bhajjis except that in powder form. the outcome is really nice and crunchy and goes along with anything. Take a kadai and saute the ginger garlic paste in little oil. Add in the bell peppers with a dash of salt and let the raw smell go. 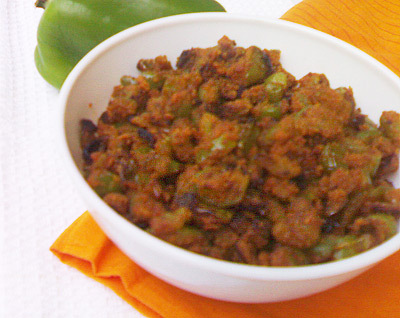 Mix all the powders together and start mixing little by little to the bell pepper in the kadai. Check for salt and add little more oil too…keep frying till the flours are well mixed and the curry looks roasted. Ur picture is superb pa, definitely believe that the taste will also b too good like ur pic. tks.